Content marketing is a proven commodity that marketers can employ to get results. In fact, more than 85% of marketers use content marketing to generate more engagement and increase sales. And marketing departments spend an average of 13% of their budgets on content marketing, which leads the way. But to connect with buyer’s today, you have to focus on their needs and educate them about your products or services. 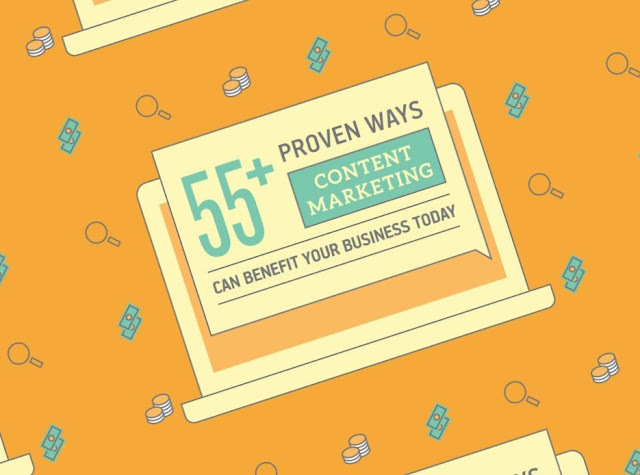 Here are 55+ tried-and-true ways you can utilize content marketing to help your business grow. Informative blog and social content can help bring your audience to the surface, which can, in turn, convince them to access your offer and become a lead. Once they enter the sales funnel, you can continue to nurture them by personalizing instructive content and answering their questions to fit their needs. The more web traffic and time spent on site, the higher your ranking with search engines as well. Higher rankings mean more organic hits and a better rate on paid advertising. Again, providing quality content is imperative for attracting prospects. If you can build a reputation for being a reliable source in your area of expertise, you will not only earn your customers’ trust, they will come back again and again because they know you can provide the answers or solutions they’re looking for. In a nutshell, content marketing is your platform for illustrating your knowledge and expertise. Once a lead has entered your sales funnel, it’s your time to shine. The more quality and tailored content you provide based on their position in the sales funnel—whether it’s an informative webinar that answers your leads’ burning questions or a promotional email offer that is too good to pass up—the more you will gain your leads’ trust. And as time goes by, they will recognize your expertise and be more likely to turn into a buyer. It sounds like a broken record, but if you’re providing good content, your customers will clamor for more. They’ll want to continue to subscribe to your email list if they know they’ll be educated, receive special offers, and have the opportunity to check out illuminating webinars. And the same can be said for your prospective audience, as you continue to beat the bushes by building brand awareness via your informative content. Finally, although marketing departments spend the most on content marketing, they also get the most bang for their buck. In fact, content marketing generates more than three times the number of leads than outbound marketing while costing 62% less. Sharing quality content via your blog posts, email, social media, and website is a no-brainer because you are bringing customers to you. And your content “store” is open—introducing people to your value and excellence—even when your business isn’t.